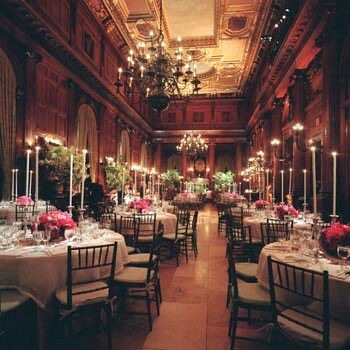 On October 23, 2014, PayPal co-founder and Silicon Valley venture capitalist Peter Thiel is scheduled speak in Midtown Manhattan to a banquet hall room full of people about “the future of Western Civilization.” In the audience will be members and guests of the Intercollegiate Studies Institute, a “non-profit, non-partisan, tax-exempt educational organization” whose philosophical pillars lean towards traditional libertarianism. 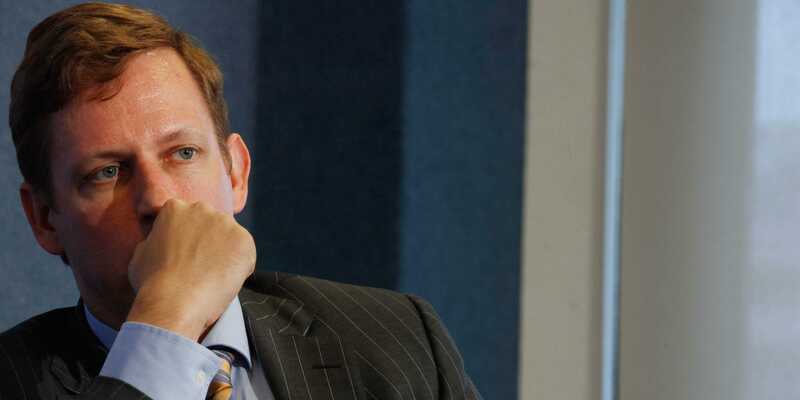 Thiel is the first ISI alumnus to speak at the annual event, but other prized alumni include Supreme Court Justices Samuel Alito and Antonin Scalia, and popular media commentators such as Ross Douthaut and Ann Coulter. While PayPal was Thiel’s first splash of public attention, over the past decade he has established himself as a prominent, and somewhat controversial, cultural figure. He was the first outside investor in Facebook back in 2004, and has been a prescient investor in several other successful startups (such as LinkedIn, Yelp, Yammer, Quora). In 2010, he launched his Thiel Fellowships program, which awards entrepreneurial-minded students a $100,000 stipend to reject university and instead pursue their individual idea or venture. Thiel has also been a financially active, and sometimes intellectually aggressive, proponent of libertarian philosophy and grandly eccentric causes such as anti-aging research and seasteading (the creation of floating island nation-states). Most recently, a fictionalized – though more overtly autistic – version of Thiel was featured in Mike Judge’s 2014 HBO sitcom “Silicon Valley” (played by the late Christopher Evan Welch). “The future of Western Civilization” may seem like a big topic for anyone to tackle, but Thiel has already lectured many audiences on equally grand ideas. In 2013, he delivered the keynote speech at South by Southwest (SXSW), an annual conference in Austin for people working at the cutting-edge intersection of entertainment and technology. The speech strove to provide an analysis of world history as seen through the philosophical lens of “determinate” (a.k.a. the world can be known) versus “indeterminate” (a.k.a. the world cannot be known) perspectives. The speech, titled “You Are Not A Lottery Ticket,” is based on a class lecture Thiel delivered to a “CompSci183: Startup” course at Stanford (the notes of which were preserved online, and later turned into a book, by one of his student-devotees). If during the earlier stages of his career Thiel focused on the world of high-tech startups as his petri dish of human behavior and development, he has since expanded his purview to include the country and even the world. 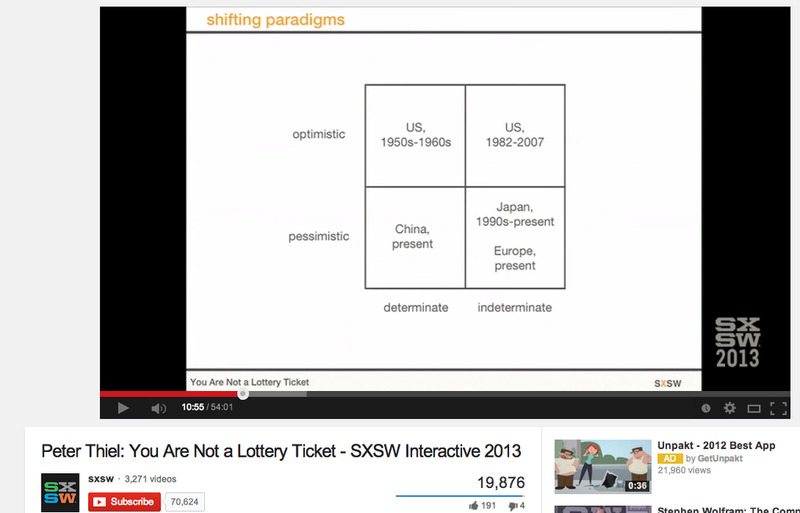 In that lecture, Thiel applies his “determinate vs indeterminate” philosophical matrix to virtually everything under the sun: “investment vs. savings” rates; the relative prominence of “calculus vs. statistics” and “substance vs. process”; indeterminacy as it applies to politics, literature, death, cosmology, and, finally, startups. But the emotional core of Thiel’s talk is his application of the matrix to America and its place in recent world history. Thiel identifies the 1950s-1960s as the golden era of US “determinate optimism,” a time when the country was confident and clear-headed about its ability to understand the world, control it, and build on it towards a better future. During this time, the world could reliably look to the US as a guiding light — or, to borrow from tech lingo, a “best practice.” But in the decades since, as the American light has been diminished by social and economic turbulence, by failed and costly wars, Thiel warns that the world is sliding towards the opposite quadrant of “indeterminate pessimism.” Japan and Europe, he argues, have already beaten us there. Accelerated by the symbolic tragedy of 9/11 and the 2008 Great Recession, Thiel notes that the US has already slipped into “indeterminate optimism” and we’re close to joining the desperate ranks of Japan and Europe, if we haven’t already. Thiel applies his philosophical matrix to recent geopolitical periods. In interviews, Thiel often recalls the era of massive urban and infrastructure projects, the sci-fi epics of his childhood where humans explored the cosmos and colonized far-away planets. Today’s zeitgeist seems plagued in perpetual bureaucratic dysfunction, and today’s sci-fi has taken a markedly dystopian turn, often concerning humans who are consumed by ever-more complex technologies and systems they created but can no longer fully understand or control. The overarching theme of Thiel’s SXSW talk, and the probable theme of his upcoming ISI talk, is that America – and the world – must abandon the current, default philosophical view that the world and future outcomes are completely unknowable. Instead, we must take the tools and knowledge that modern society has inherited and again start designing and building toward an ambitious future. Viewing society’s greatest weakness as a lack of cultural imagination and confidence, Thiel’s thinking seems not only logical but urgent, and surprisingly obvious — like a nagging impulse felt over the recent decades, but which we have learned or trained ourselves to ignore or shake off as impractical. Once we acknowledge this crisis, the pressing question becomes: How do we go about agreeing on what we need to do next? Those on the political left might suggest that we already have ambitious plans for infrastructure and research initiatives, we just need the public funding to pursue them. Those on the right might counter that in a leaner and meaner, globalized 21st Century, we should instead liberate and foster private enterprise as the most efficient vehicle to build our tomorrow. Unfortunately, the current state of America’s ailing – if not broken – two-party system almost ensures stalemate. The paradox is that we are at a historical moment which may be unprecedented in its technological capacity to conjure new futures and possibilities. Does the advent of the Internet and the rising prominence of social media not warrant equally ambitious thinking and planning as the automobile did for the Interstate System? (Launched by Eisenhower, a Republican, in 1956, the Interstate took 35 years to finish its first phase). It might not be a surprise that Thiel hates politics. It might also not be a surprise that one of the preeminent living and breathing examples of a new “deterministic optimistic” vision for the future comes from someone in Thiel’s close social circle. 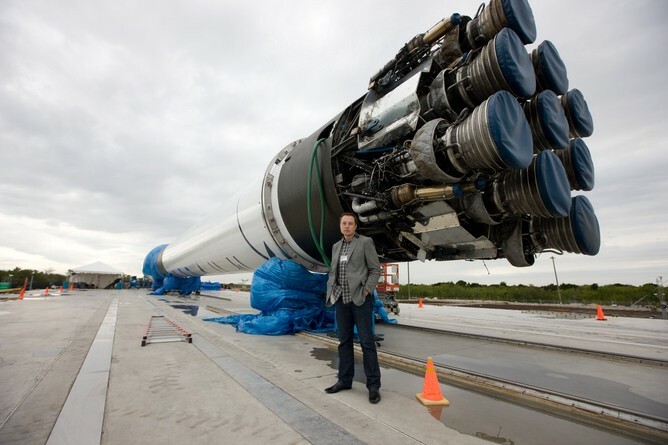 Fellow PayPal co-founder Elon Musk has proven himself to be the world’s closest analogue to the fictional Tony Stark, or “Iron Man.” Musk has spent the past decade using his profits from PayPal to foster an industrial triumvirate of long-term ambition: solar energy (Solar City), electric cars (Tesla), and reusable rockets (SpaceX). In interviews, Musk often speaks on a similarly grand scale as Thiel, a manner that — once you learn of their fraternizing past — can sound a bit like inspired, late-night, dorm-room theorizing. While Thiel preaches about the need to re-think our pervading philosophical mindset, Musk focuses on the need to establish “interplanetary life” as the central, urgent challenge facing humanity. His stated life-long goal is to be the first man to live on Mars, which he sees as our next, critical move on the intergalactic chessboard of interspecies survival. Thiel and Musk were both accomplished youths: Thiel was a nationally ranked Chess Master; Musk sold his first computer code to a video game company at the age of 12. Musk has also professed a similar childhood fascination with sci-fi. Listening to both men, their strikingly similar psychologies become evident. Possibly a result of their mutual upbringing in the worlds of engineering and programming, their words and thought patterns seem to break down the world into a never-ending series of experiments and outcomes to be perpetually analyzed. Musk may be the foremost embodiment of Thiel’s “deterministic optimism,” but he’s also not deluded about his conquest, or the nature of the tools at his disposal. He still worries about aspects of technological advancement, and artificial intelligence is one area in which he has become a passive investor “just to keep an eye on things.” Thiel, alternatively, is a strong proponent of machine intelligence and has donated over $250,000 toward the annual Singularity Challenge. One can imagine this being a contentious point between Musk and Thiel, causing a sudden lull in their dorm-room philosophizing. 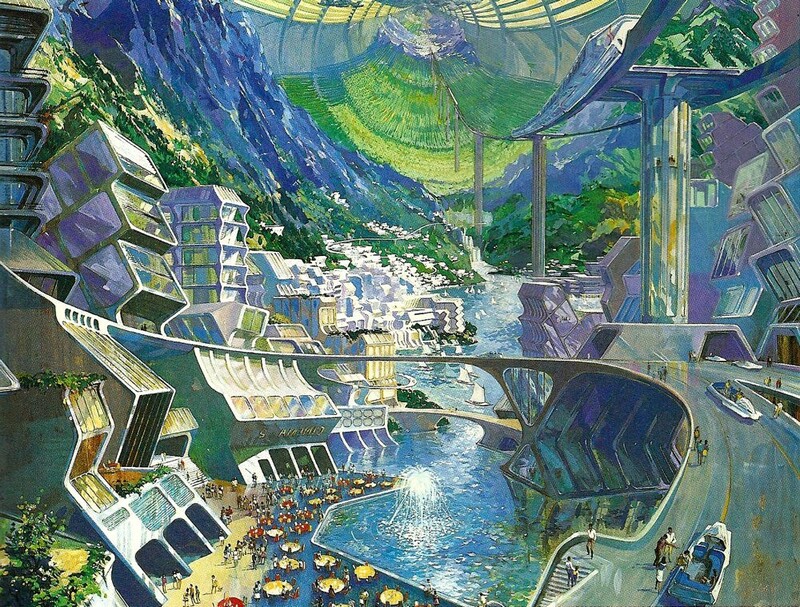 A “toroidal space colony of the future,” from the concept art for Walt Disney’s Epcot Center. (Courtesy of paleofuture). In their wildest dreams, just like in their favorite sci-fi epics, Thiel and Musk want to colonize the moon, then Mars, then the galaxy, defeat death and live forever. Whether their dreams are inspired or delusional, they represent two of a small pool of cultural visionaries who are jaded with doomsday scenarios and instead offer views of the future we can arguably get excited about. 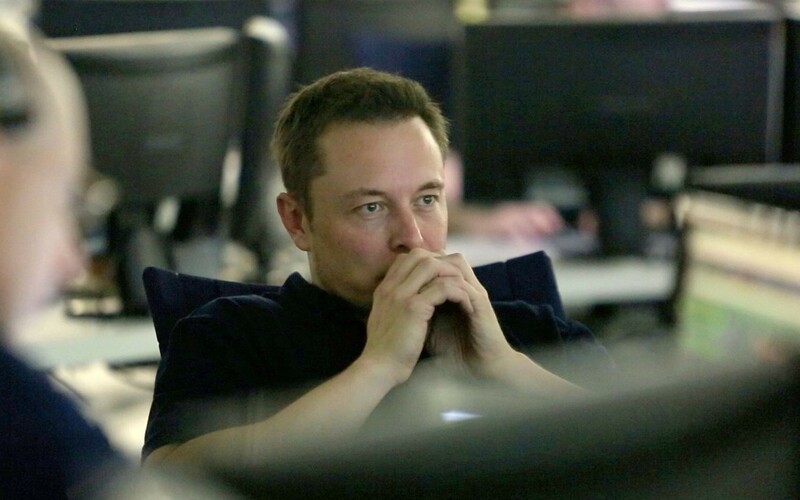 In the months since, Musk has backed away from discussing the plan, sheepishly admitting that he almost regrets releasing it in the first place. He conceded that while he’s optimistic about the concept, he doesn’t have the proper time or energy to seriously pursue it. Can anyone blame him? Instead, Musk hopes someone else will take and build on the concept. We’ll just have to wait and see if anyone does.